We all have them – blindspots, that is. I’m not arguing that point in this post. It’s not that I didn’t like the book – And no, it’s not about patriarchy or feminism or equality between the sexes. BUT. He does point out how cultures have used the biological differences (aka wombs) as the foundation for cultural reasons why men should be in charge. Then he goes on to perpetuate that same stereotype and hierarchy in the language he uses to refer to people. Yes, in some places does he use the more precise and clear “humanity” and “humankind,” but in other places he reverts to “mankind,” or even, ugh, “men of science.” At the very least, where was his editor? And how can he possibly miss how his language is perpetuating the problem? BLINDSPOT. He sees the vicious circle clearly when addressing how men – yes, I mean men – of color were excluded from white collar jobs and therefore since no men of color held white collar jobs, clearly they weren’t capable of white collar jobs. But he’s blind to how he does the exact same thing when it comes to women. Part 3: The Unification of Humankind, opens with this sentence: “Unlike the laws of physics, every MAN-MADE (in case you couldn’t guess, emphasis all mine) order is packed with internal contradictions, and cultures are constantly trying to reconcile these contradictions.” Hmmmm. Women aren’t part of culture? 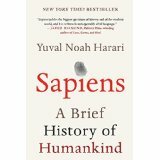 This entry was posted in Uncategorized and tagged "Sapiens: A Brief History of Humankind", academia, amygdala, blindspots, compassion, heart rate, humankind, Jesus, man, mankind, men, patriarchy, sexism, threat, women. Bookmark the permalink. Man…..ahem…I mean HUMAN I hate Blind Spots too! While referring to God in your sermons do you use the word “He” or “She” ? I don’t use either – I use “Creator,” “Maker” “The Almighty” “The Divine” “The One who Made Us” – there are tons of ways to refer to God!